The Volumetric OR is an interactive virtual reality concept that transforms how physicians record and learn about surgical interventions. 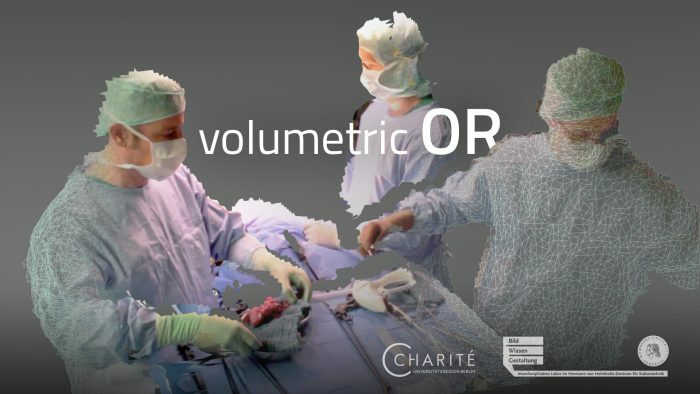 Volumetric OR presents a new approach to fostering the complex interaction between, and collaboration by, surgical health professions – surgeons, anaesthesiologists and surgical assistants. Situated in a virtual reality environment, users can experience surgical workflows based on the spatial reconstruction of photo and video images recorded directly in the operating theatre. Volumetric OR represents a new form of video-based content, which can be used for digital training and education as well as for quality assessment, legal documentation and recruitment. While existing video-based formats restrict users in terms of scale, perspective and field of view, in virtual reality applications users become part of the image, enabling them to experience a scene three-dimensionally, from any perspective and in real scale. They can navigate through the surgical team’s workflow using metadata and contextual information. This transformation ‘from observation to participation’ and ‘from screen to space’ has traditionally been one of the advantages of simulation-based strategies for digital learning, which are more cost-intensive than conventional learning strategies and difficult to scale. By enabling hospitals to produce their own volumetric content, they can improve, accelerate and evaluate surgical skills and workflows in the OR in an interactive and photorealistic environment. By connecting sensory and motor skills, virtual reality creates a new form of embodied participation that allows users to apply acquired theoretical knowledge in a practice-oriented context, helping them to advance along the learning curve during their general training.